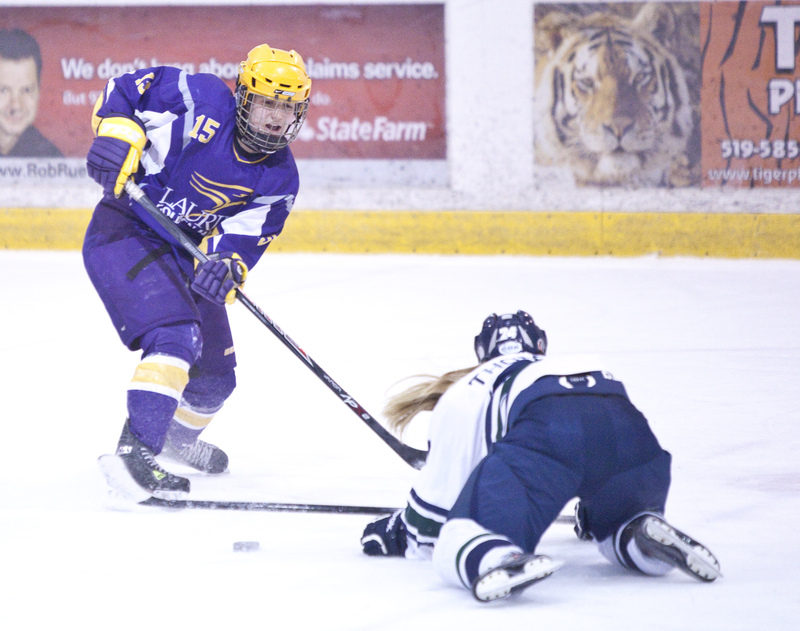 The Wilfrid Laurier Golden Hawks women’s hockey team hosted the Nipissing Lakers and the Laurentian Voyageurs during their final home stand last weekend. In what were games very much dominated by special teams and a prediction of what the playoffs will look like in a few weeks, the Hawks came out with the sweep, defeating the Lakers handily 6-1 and the Voyageurs 3-1. During the game against the Lakers, the Hawks were able to convert on three of their six chances on the powerplay, and only allowed one powerplay goal in four opportunities. Heading into the final games of the season and into the postseason, special teams will become even more important to capitalize on opportunities. “For a team who is a high scoring team in the [Ontario University Athletics] OUA, playoff time has a real way of minimizing the high-scoring teams in the regular season. Playoff time has become more of an emphasis on special teams, particularly on the power play. It’s really important that we convert on some of our powerplays,” Laurier head coach Rick Osborne said. Playing at such a high level of competition with competitive opponents really amps up the atmosphere, especially during playoff time, according to Osborne. But Laurier has struggled on the powerplay over the regular season. Osborne hopes to change that as they enter the playoffs. Unfortunately, during the second game this weekend, the powerplay units were unable to get anything done. However, the Hawks were able to stop all five opportunities Laurentian had with the extra man. The women’s hockey program also gave honour to their two graduating players, fifth-year defenceman Candice Styles and fifth-year forward Skeats, who played their last regular season home game on Saturday. Both Styles and Skeats were sent off in style, as both graduates scored two goals each against Nipissing, and added three assists against Laurentian — two from Styles and one from Skeats. Laurier finishes off the regular season this weekend when they face the Windsor Lancers and Western Mustangs on the road. Puck drops at 7:30 p.m. on Friday and 4 p.m. on Saturday. Laurier has the potential to finish as high as first in the OUA or as low as fourth, depending on the rest of the OUA.